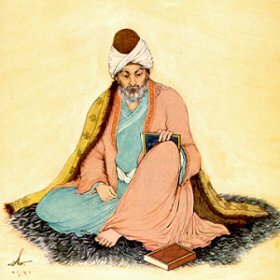 This recitation of and commentary on the poetry of the 13th century Sufi teacher, Jala ad-Din Muhammad Rumi, offers entry into a universal path to self-discovery and healing. By exploring the images, symbols and messages in Rumi’s poetry and stories, one can develop inner knowledge, spiritual insight and health, mental and physical. This entry was posted in DirecTalk Podcast, Podcasts and tagged DirecTalk Radio, Fariba Enteshari, Institute of World Culture, The Rumi Educational Center on May 16, 2016 by joemiller. John Mead taught college-level music for 20 years – and at art academies in Italy, in Greece and in Chicago where, born to be a compulsive explainer, he developed skills in demystifying the intricacies of music to non-musicians. 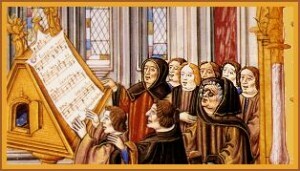 His love of 16th century music started with ecstatic experiences as a cathedral chorister at age 14. 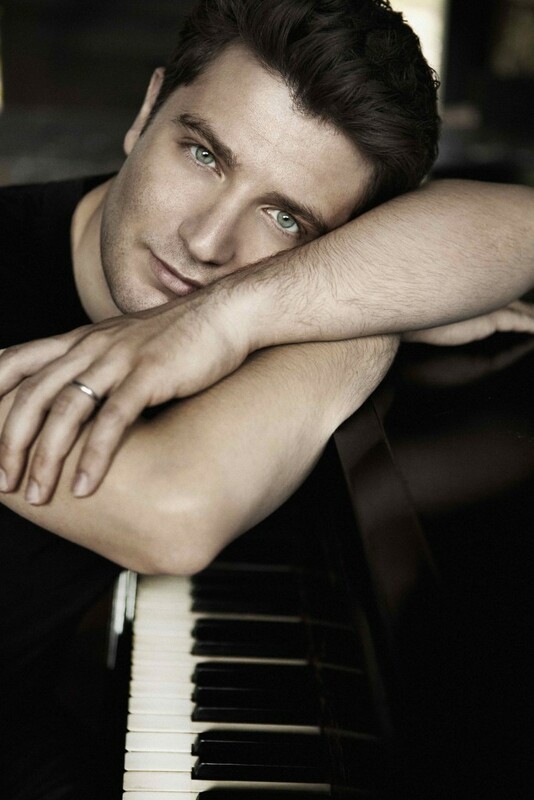 His formal education included classics studies at a preparatory level, then studies in composition with Leo Sowerby (Pulitzer Prize, 1937 and the Prix de Rome,1941). John’s mentor and teacher for conducting, et al, was William Ferris, twice nominated for a Pulitzer. John has held positions as organist and choirmaster – while concurrently teaching high school mathematics and then later working in IT. His association with Buckminster Fuller (1971-72) in Greece had a profound influence on his life including spiritual matters and completion of the M.Sc. This conversation was in anticipation for John’s presentation The Genius of Renaissance Music in collaboration with Adelfos Ensemble, at The Institute of World Culture in Santa Barbara, CA on May 7, 2016. This entry was posted in DirecTalk Podcast, Podcasts and tagged Adelfos Ensemble, John Mead, KCSB on May 16, 2016 by joemiller. Interview with Anoushka Shankar by phone to Washington D.C. on March 31, 2016, the day before the beginning of a month-long tour for her new album Land of Gold, inspired by the current refugee crisis. The varied elements of Land of Gold grew “from the ground up,” says Shankar, and represent a new level of artistic strength and truth. At foundation is the quartet of sitar, double-bass (Larry Grenadier), shehnai (Sanjeev Shankar) and hang drum (Manu Delago). Vocal appearances include M.I.A. in an electronica-rap track; singer-songwriter Alev Lenz with lyrics and voice for the title song; and actress Vanessa Redgrave delivering a powerful reading of a new poem by Pavana Reddy about belonging and resilience. Shankar brought her quartet to Campbell Hall on Monday April 11 at 8pm, courtesy of UCSB Arts & Lectures. This entry was posted in DirecTalk Podcast and tagged Alev Lenz, Anoushka Shankar, DirecTalk, Land of Gold, Pavana Reddy on April 14, 2016 by joemiller. 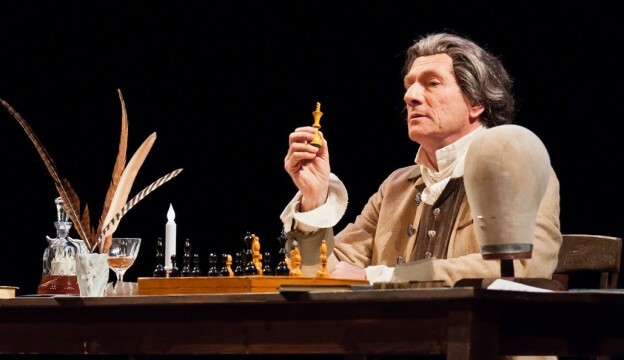 This week on DirecTalk Radio: Actor and writer Ian Ruskin as Thomas Paine speaks with Joseph Miller. Anglo-American actor IAN RUSKIN trained at Royal Academy of Dramatic Art and performed in England for 15 years. He came to Los Angeles in 1985 and worked primarily in television; usually guest starring as the intelligent bad guy in shows such as “Murder She Wrote”, “Scarecrow and Mrs. King” and “MacGyver”. This work paid the rent but did not in any way fulfill his dream as a student at RADA – to work in plays that would affect an audience. A pivotal moment arrived in 1994 while playing the lead in Rob Sullivan’s Strike Story: The Harry Bridges Story. A rehearsed reading before the ILWU, the renowned labor leader’s own union, was capped by a ten-minute standing ovation. Some years later Ruskin put his hand to writing and recording radio documentaries and one-man plays, including From Wharf Rats to Lords of the Docks, which was eventually directed and filmed for PBS by the legendary Academy Award-winning cameraman, the late Haskell Wexler. In 2010 Ruskin received a COLA [City of Los Angeles] Fellowship to write To Begin the World Over Again: the Life of Thomas Paine, and has toured over 60 performances to date, including Harvard Law School, The American Philosophical Society, the ACLU, and the Royal Academy of Dramatic Arts. What’s more, a film adaptation (Wexler’s final project, before passing away at 92), narrated by Elliot Gould, is now complete and will be featured on PBS nationwide later this year. Ruskin brings his play to Santa Barbara on Saturday afternoon February 13 for one performance at the Faulkner Gallery at the Central Public Library. The performance is free, and hosted by The Institute of World Culture. This entry was posted in DirecTalk Podcast and tagged Common Sense, Faulkner Gallery, Haskell Wexler, Ian Ruskin, Institute of World Culture, Joseph Miller, Thomas Paine on February 6, 2016 by joemiller. My volunteer duties at KCSB-FM sometimes include writing and producing PSAs. This one was a lot of fun. 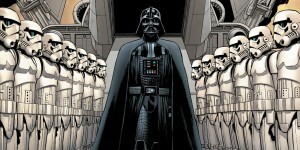 This entry was posted in Classical Now Podcast and tagged 5th Symphony, Beethoven, Darth Vader, John Williams, KCSB, Star Wars on November 30, 2015 by joemiller. 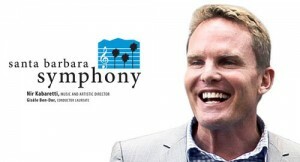 Australian native David Pratt recently joined the Santa Barbara Symphony as Executive Director after serving in the same position for the Savannah Philharmonic. Pratt also has held senior positions for the G’Day USA Festival connecting the U.S. and Australia, the Sydney Symphony Orchestra, the Australian Festival of Chamber of Music, and the Melbourne Film Office for the State of Victoria. I met with Pratt at the Santa Barbara Symphony offices in downtown Santa Barbara on May 7, 2015. This entry was posted in DirecTalk Podcast, Podcasts and tagged David Pratt, Nir Kabaretti, Santa Barbara Symphony on November 10, 2015 by joemiller. This week on THE CLASSICAL NOW, my interview with TEMMO KORISHELI, director of Adelfos Ensemble. 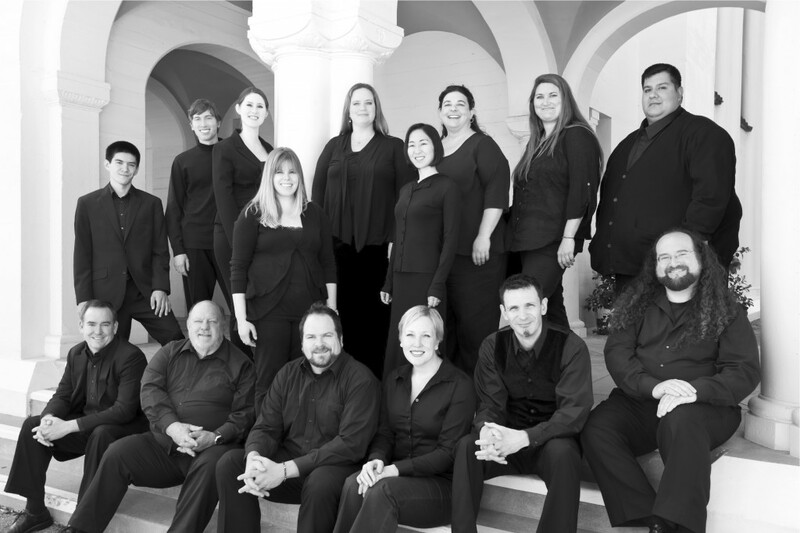 For eleven years the a cappella vocal ensemble Adelfos has grown and evolved from its beginnings as a men’s-night-out group, equal parts camaraderie and art (self-described “drinking group with a singing problem”), to its current splendor as a mixed ensemble consisting of some of the finest and most experienced singers in Santa Barbara. Korisheli, an early music scholar and cataloguer at the UCSB Arts Library, began directing Adelfos in 2008, and changed the group forever in two key ways: thematic programming, and in 2010, adding women’s voices. I sat down with Temmo for a wonderful hour at UCSB in anticipation of Adelfos’s performances next weekend: “All Angels Cry Aloud: Music for the English Church,” a program of Anglican cathedral music featuring the recently-appointed organist of Trinity Episcopal Church, Dr. Thomas Joyce. Visit Adelfos on Facebook for more information. This entry was posted in DirecTalk Podcast and tagged Adelfos, DirecTalk Radio, Temmo Korisheli, The Classical Now, Thomas Joyce, Trinity Episcopal Church on June 1, 2015 by joemiller. Sting quartet heaven — that’s what we are experiencing in Santa Barbara right now — with Julliard, Emerson and Brooklyn Rider all performing in a span of 3 weeks. But Brooklyn Rider–performing Thursday at Hahn Hall, courtesy of UCSB Arts & Lectures–is in the forefront this week on DirecTalk Radio, a special spoken word feature of THE CLASSICAL NOW. Starting at 7am, I will air my exclusive interview with COLIN JACOBSEN, violinist and composer with Brooklyn Rider. Jacobsen credits the poetry of Russian painter and art theorist Wassily Kandinsky, as well as the writing of David Byrne, as inspiration for his most recent composition. 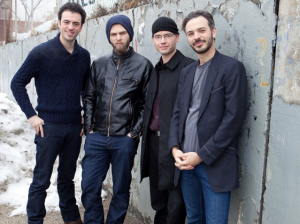 Rider is touring their new album, The Brooklyn Rider Almanac, which throws the compositional gauntlet to thirteen progressive musicians who have little to do with the traditional classical concert hall. This interview originally aired on the January 19 episode of THE CLASSICAL NOW – 6am – 8am on 91.9 FM KCSB Santa Barbara. And streaming live at www.kcsb.org. This entry was posted in DirecTalk Podcast and tagged Brooklyn Rider, Brooklyn Rider Almanac, Classical Now, Colin Jacobsen, DirecTalk Radio, Hahn Hall, UCSB Arts & Lectures, UCSB Up Close & Musical Series on January 19, 2015 by joemiller. Tom Whitaker is directing the UCSB Department of Theater and Dance’s fall production of Will Eno’s Middletown, a play which draws inspiration from Thornton Wilder’s Our Town, yet is stamped with the insignia of a playwright who has been called by the New York Times, “a Samuel Beckett for the Jon Stewart generation.” An essential shorthand for the play might be read in a Facebook meme Whitaker came across recently: “I’m in that awkward stage of life between birth and death.” Performed by twelve actors, and set in mid-twentieth century Middle America, the play infuses the quaint relationships and familiar irksomeness of small town life with the unsettling big issues that gnaw at the psyche from underneath. I interviewed Whitaker about the production on Halloween. The segment was broadcast on KCSB-FM [91.9 Santa Barbara or streaming on web www.kcsb.org] on Monday Nov. 17, 7am on DirecTalk, a spoken word feature of The Classical Now. 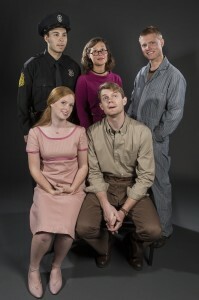 This entry was posted in DirecTalk Podcast and tagged Middletown, Tom Whitaker, UCSB Department of Theater and Dance, Will Eno on November 18, 2014 by joemiller.